islands and the Venetian hinterland. 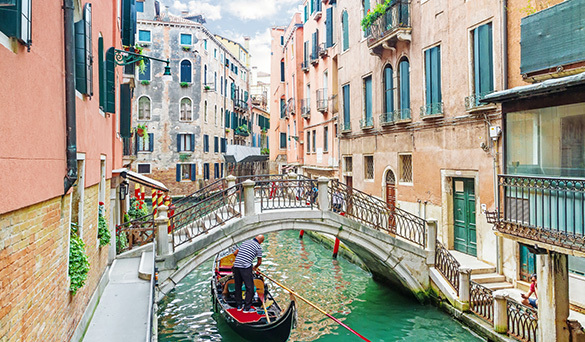 Venice is absolutely a destination not to be missed! Easily accessible from the hotel, thanks to a bus route with which you reach Punta Sabbioni and from there directly piazza St. Mark’s square by sea, this city will win you over with its magic. Explain the beauty of Venice in a few words is an impossible mission, given the endless variety of its places of interests. The ‘ city of lovers ‘, the ‘ city of art ‘, the ‘ floating city ‘; a thousand ways to try to define this city’s masterpiece, perfect and fascinating in all its manifestations. If you want to see Venice in an unconventional way and to enjoy its hidden beauties, ask at the reception about the different possible itineraries, even with fun options for kids. 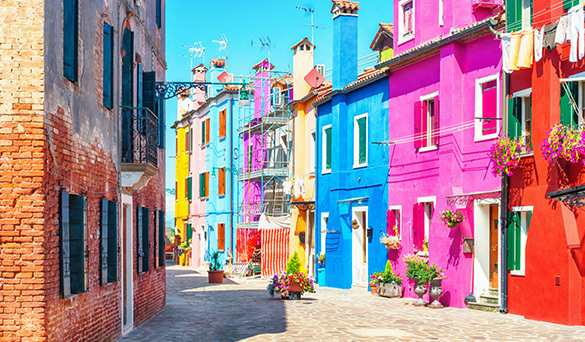 Murano, Burano and Torcello are just some of the beautiful Venetian lagoon islands, and represent its best-known face. But the great thing about a boat ride around here is to discover hidden gems. As the beautiful San Francesco del Deserto, outside the “canonical” routes and uninhabited except for the monastery of the Franciscan friars; or as San Servolo with its museum of the asylum and St George with its bell tower. World Heritage according to UNESCO along with Venice, the lagoon is one of the most beautiful places around the Veneto and, no doubt, of all over Italy! 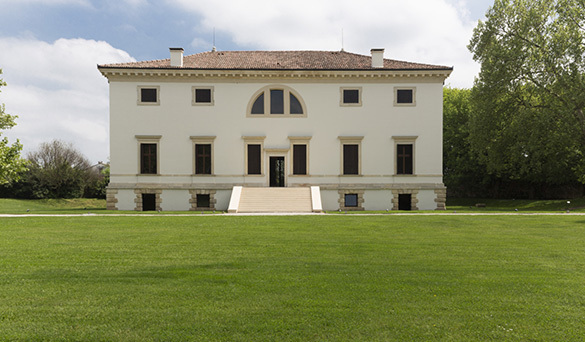 Summer is perfect to discover the most beautiful villages of Veneto: Asolo, Arquà Petrarca, Montagnana, Marostica and Cittadella are just a few of the most exciting. As soon as you enter one of these villages, the feeling is that of peace, where the pace of life is slower as if you are entering into a different era. Wander around the streets, walk along the ancient walls, admire the decorations of the palaces, step into one of the typical shops, enjoy this walk through the history. The Venetian Villas, rich patrician residences of the Venetian Republic and the medieval castles, impressive dolomite mountains, are among the most important riches of the Veneto, to admire and enjoy the peace and quiet. Some closer other about 1 hour away from the Hotel Domingo, be captivated by mighty fortresses and wonderful historic homes: The castle of Roncade is the only existing Venetian villa surrounded by medieval walls with towers and turrets, the Catajo Castle was one of the most important Italian palaces, Villa Barbaro with his collection of carriages, the “Rotonda” and finally the Queen of the villas: Villa Pisani, today also National Museum. These are just a few examples of excellence not to be missed but the list is really wide and rich. Ask for more information at the reception for a customized tour and also on the Burchiello, a romantic cruise between the Venetian Villas of the Brenta Riviera. From the famous frescoes by Giotto in the Scrovegni Chapel and the ancient University, Caffè Pedrocchi and the Palazzo della Ragione until the Basilica di Sant’Antonio and the Basilica of Santa Giustina…Padua is a city that will fascinate every visitor. 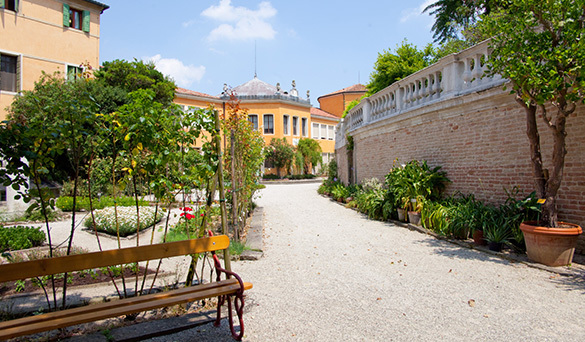 The Botanical Garden of Padua, was founded as a medicinal garden of the University of Padua in 1545 and is the first and oldest university botanical garden which still exists. Today the Botanical Garden welcomes 6000 different species, and since 1997 is part of the Unesco World Heritage List as a cultural asset. Dante Alighieri in the Divine Comedy describes it as the place “where in Sile and Cagnan meet”. It was often compared to Venice for the numerous rivers that criss-cross the city and also for this is a destination that charms. 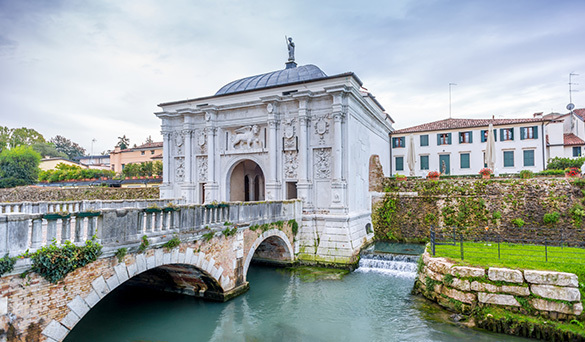 Enjoy a walk on its large walls, admire the characteristics frescoes on many of its buildings, stop for a coffee in its spacious and stately piazza dei Signori, stroll along the shopping street of Treviso, the Calmaggiore,and then head for the “Pescheria”, the picturesque fish market where you will also find an old watermill. Visit Treviso also means getting lost in its narrow streets, in the arcades and discover hidden corners that seem coming from postcards. And while you enjoy this panorama, sip a good local Prosecco. 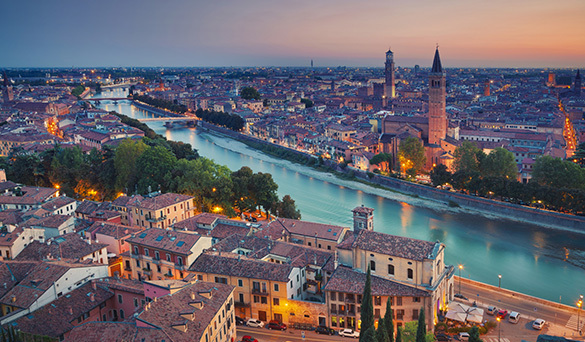 City of love par excellence, Verona is famous especially for the story of Romeo and Juliet. Of the city is immediately striking the fascination which emanates through its millennial and layered history. Starting from Piazza Bra with its famous and magnificent Arena, continuing along Via Mazzini, the historic shopping street that leads to Piazza Erbe and then to Stone Bridge from where you will see the Roman Theatre and its suggestive archaeological museum. 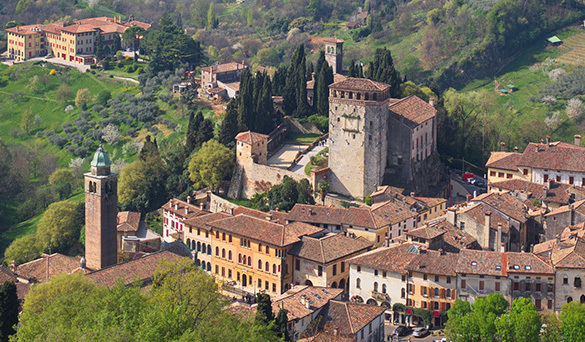 More lovely place not to be missed is Castelvecchio with the Ponte Scaligero, that gives us one of the most beautiful views of Verona. The Queen of the Dolomites … this is Cortina d’Ampezzo. The city is the most known and frequented destination by the jet set, especially in winter. It is not rare to encounter celebrities prowling among the boutiques and shops of Corso Italia, the most exclusive shopping street in town besides that the street ideal for a walk in the late afternoon, when is alive with tourists. The symbol of Cortina is the Bell Tower, visible from almost anywhere in the Valley. If you are keen on hiking follow one of the 400 km of marked trails, where you can see deer, roe deer, foxes and all the protected flora of the beautiful landscape of the Dolomites. 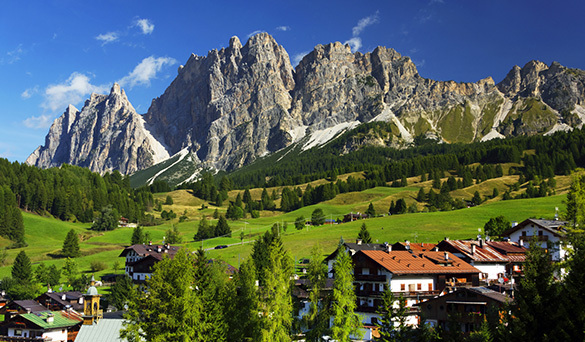 The Dolomites are a Unesco World Heritage Site since 2009. Take the “wheel taxi bob” a bob with wheels, allowing you to experience the thrill of a descent down the Olympic track even in summer. And why not end this beautiful day with the rise to 1750 meters of Lake Misurina (about 15 minutes), where in summer are reflected the 3 peaks of Lavaredo. In an hour you can make the full turn of the lake through a delicious path.